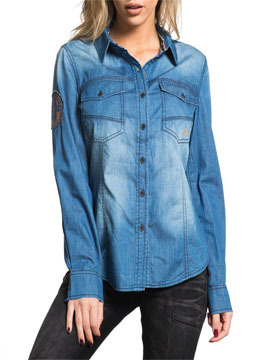 Affliction Blue Dawn womens long sleeve button up woven denim dress shirt features two pockets with small Affliction script logo printed on of one side. Fleur embroidered patch sewn on one sleeve. Light sanding on front and back creates a vintage look. 100% cotton. light weight, slim fit, custom buttons. Garment dyed with silicon wash for soft feel. Color: blue indigo.